The Brazilian GP was almost a microcosm of the championship this year; fate played games, suggesting first one result, then another, with everything being decided at the last corner of the last lap. All good for the show, of course, which merely makes me wonder if Max and Bernie were somewhere behind the scenes, pulling the strings. I cannot escape the fact that, without the dubious penalties handed to Hamilton through the year, everything would have been decided long before the circus came to Interlagos. In the end, Lewis emerges as champion so justice is done, I suppose. It would have had a better taste without the interference from officials, however. And I must be grateful that Massa did not sneak the title at the last, with all the sour grapes and bitterness that would have entailed in the Hamilton camp, plus the sickening crowing from the other side. Just as Kimi was the best result for international relations last year, so Lewis is this time around. Apart from the championship battle, the race was not bad, if a little "settled" in the middle. Sebastian Vettel's pressure on Massa after the first pit stops certainly livened things up, demonstrating how close the cars have been in performance this year. And Fernando Alonso climbing into second spot confirms his growing reputation as the wily old fox of F1. If McLaren miss him for anything, it should surely be this apparent ability to capitalize on events as they happen; their strategy this season has been flawed at times and difficult to explain at others. Perhaps the same could be said of Toyota, whose remarkable improvement through the year has been accompanied by strategic decisions that too often have disadvantaged their drivers. Interlagos was a perfect example, the team somehow managing to transform Trulli's front row grid spot into an eventual eighth finishing position. The fact that Glock magically became the key to the championship in the last few laps was only the result of a last gasp throw of the dice, a desperate attempt to gain a few places by staying out on dry tires. My favorites, BMW, managed to be the clowns of the show this time out. After the wild gamble of starting Kubica on dries and thereby necessitating an immediate stop to switch to intermediates, they demoted him to the tail end of the field. From there he managed to be in a position to spoil others' races, most notably Hamilton's with Vettel. And Mr Consistency, Nick Heidfeld, made a poor start, dropping instantly to 12th, and made little progress from that moment. In fact, this was a bad race for those trying to impress their bosses at the last. Nakajima found himself off the circuit in the aftermath of Coulthard's spin (induced by a knock from Kazuki's team mate) and then showed later in the race that he needed no outside assistance to indulge in such grass-cutting activities. Sebastien Bourdais also managed to put himself in position for Trulli to send him careering on to the green stuff. And the less said about Piquet, the better, I think. So it was a race full of incident, mainly thanks to the brief rainfall at the beginning and end, and we can be satisfied that the 2008 season went out with such a finale. Next year sees new regulations and new cars, but with the caste pretty much as it has been. The big question will be: can anyone stop Hamilton, now that he has achieved the first of what will probably be many championships? Fantastic result and the correct one in the name of fairness. Hamilton drove a good race and was seemingly let down again by the rest of the team leaving him out too long. However the team and lewis managed to just about keep it together for a historic win. Was it me or did Kubica seem to almost purposefully cut straight in front of lewis to ruin his line through the corner and hence let vettel through? All I can say is thank you to glock! I really would like to think that he slowed in order to let the correct driver become the champion although it was highly likely it was his tyres which gave out. One sour point. Why on earth are all the US news sites headlining on Lewis being the first black driver to win f1 rather than the fact that he is the youngest. The UK sites never mention his race. The US seems either too focused on race or is still finding it hard to treat everyone as equals. 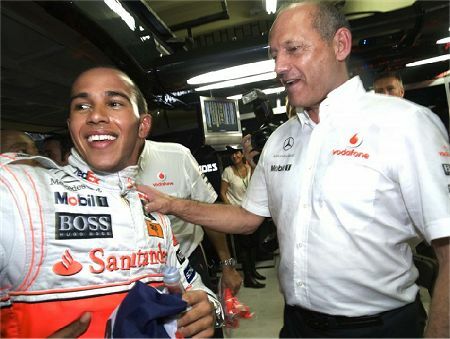 In the UK Lewis is a British racing driver, race is irrelevent. Anyway, A great end to a controversial season. Lets hope next year sees more overtaking and less interference from the FIA. Also I would love to see williams back near the front where they belong. Lets also hope for the sake of racing that the real kimi turns up next season. A mixed bag of a race for sure. I was incredibly disppointed that DC was punted off in such an ignomus manner in his final race. I wonder too, if that was to be the final race for Rubens, Piquet Jnr and Le Seb? Anyway I'm glad that Lewis won in the end, and would love to have seen the look on S&Max & Mini Me's dials when that happened, for all they did to prevent it. I did feel sorry for Massa though, even though I think he should not have even been in contention. Interesting sour point, Lee. The US is just maturing in that sense. But let's remember, the US may be electing their first president of color tomorrow, so it's a very interesting week for them in that regard. Good point, Clive, on the "It would have had a better taste without the interference from officials, however. " The questionable calls by the stewards this year are something I hope will not be repeated. I know, but I can hope...right? Gotta have some sympathy for Mass though. So, when do we start talking about next year? It is interesting to note how quick Vettel was, (with his Ferrari engine.) How valuable a tool, supplying engines can become. I am left feeling pleased McLaren won in the face of Mosely and his political thugs. To penalize a team the irrational sum of money and have them still come through to win the title is the best slap in the face (to Mosley) I could have wished for. Now, what's this about "money saving," omelet face? If we are to believe public persona I would prefer to have Massa over for supper than Hamilton. He appears to be the one who is more gifted socially. As drivers go, they are both quite capable of winning, or losing a championship. Lee: I don't know what it is about McLaren but they seem to make a lot of unnecessarily complicated calls on strategy. Perhaps it's an over-reliance on computers but it really seemed at Interlagos that the team opted for a strategy so defensive that they nearly threw Hamilton's title away. Kubica drove like a maniac, I thought, considering he was interfering in a battle for points and the championship, whereas his own race was done. It's all very well to unlap oneself (which he could not do without passing Massa), but endangering drivers who were still racing was bad manners at the very least. Sour grapes, perhaps? A comparison of Glock's last three lap times with Trulli's (also on dry tyres) shows that Timo was doing as well as he could. Trulli's final lap was every bit as slow as Glock's. Pink Peril: Renault are going to announce their drivers for 2009 on Wednesday, apparently, so we should soon know whether Piquet Jr survives. Barrichello must be worried about his seat even with Alonso out of the equation; Honda are desperately in need of new blood. It would be a travesty if Bourdais were to be dropped, however (and bad for STR too - they need some continuity). Le Seb has shown that, given decent luck, he can be every bit as quick as his team mate so what would be the point of replacing him? Gusto: Yes, one in the eye for Max and Bernie for a change. But it really didn't need to be that close. I agree with you about Kubica - his driving was completely irresponsible. Don: I'll join with you in the hope of better stewarding next year. But I have no sympathy for Massa and will explain why in my next post. Nick: Good point about the constructors' championship - it is being overlooked that those points taken from Hamilton and given to Massa were also points deducted from McLaren's score and donated to Ferrari. I haven't done the math yet but would guess that McLaren should be WCC as well as having the WDC. Can't agree with you about public persona, however. Not that I think either of them would make great dinner guests. Heart was in my mouth when Vettel overtook Hamilton, honestly thought he'd lost it especially when the commentators said Glocks sectors were ok, it just must of suddenly poured huge amounts down on the last lap. Incredibly glad that justice was done and that Lewis got world championship, everyone knows he deserves it and that the FIA did everything to stop it happening. Got to admit, the first time in quite a while I've really got excited over an F1 race, leapt to my feet and cheered when Hamilton passed Glock. Shame on the Brazillian fans for booing too. Clive: Reports here in Brazil is that Piquet father was very happy after a meeting Briatore saturday. Also, Briatore seems to have agree to let Di Grassi do a test at Honda the same weekend they'd be testing Bruno Senna. So I suspect Piquet Jnr will get a second season. As for Barrichello, I'm pretty sure he is done at Honda. Early this week he was asked by Brazilian TV if he would help Massa if given a chance and he answered that he would love to Massa to be WDC but "I don't even have a car to help myself". I can't see he telling something like that to press unless he knew he was done. Rubens recent interviews about next year have being all about trying to get a seat at Toro Rosso. I hope Seb keep his drive but I don't think things looks good to him. Pootle: Yup, that was a nail-biter, all right. I think what happened to Glock was the the rain was accumulating on the track, making it more difficult on each of the closing laps. Both Trulli's and Glock's last laps show a huge increase in times as the track became wetter. But you're right about Hamilton being the true champion. Especially delicious that he did it in the face of FIA disapproval and spoiling. Filipe: I think Piquet has done enough to justify another year with Renault so your news is a relief. But I agree that it looks as though Barrichello is on the way out at Honda. That's a pity, considering that he's done no worse than Button, but he's had a good innings and the end has to come sometime. Speaking of Honda, a little story told to me by people on the paddock sunday that is their whole year in a few words. After the fire started in his car, Button went to see if someone would do anything and ended meeting his dad who just told him "let that **** burn! ".